Frivolous Friday – a bit like liquorice allsorts! Sorry guys, but first up is for the girls (mainly)! Ladies, if you haven’t ever experimented with real makeovers, today you can do it without spending a cent, without having to get the makeup on or off, and it’s as simple as loading up a photo and playing! Go here for hours (really? maybe minutes) of free fun trying on new looks without the fear that it’s actually happening in the real world. OK so I really hate the ‘choose a star’ to look like aspect, but what a hoot if you have a spare few moments! And now for something completely different – AllPysch Online, the Virtual Psychology Classroom. If you’ve ever wanted to recap on your old psych 101 learning, you can head into here and take one (or more) of the ‘academic’ tests, like this one on research methods (go on, see if you can beat my score – 80% first up!) There are a nice set of online games for fun and wasting time, especially if it’s wet over the weekend. And of course there are heaps of online texts – all free, and although not updated since 2004 (:-(), hopefully the majority of them will still be relatively accurate. OK, this one is for the boys – geekgadgets at GeekAlerts! 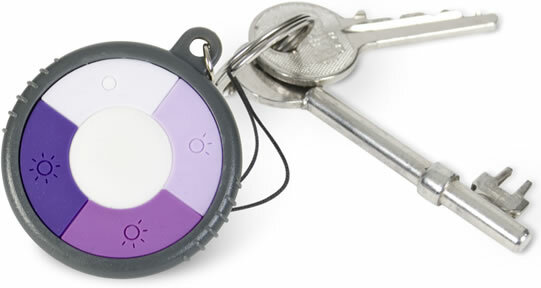 You have got to be amazed at the inventiveness of some of these people (who would have thought you needed a mini UV ray detector to carry around on your keyring? Now for this last shot – never ever forget this when you complain about having no room in the car, OK? Thanks to Dr Deb for pointing me in the direction of this cool graphic showing the common genetic links between a range of disorders…here’s the link to the full article, from The New York Times. You can find out so many teeny tiny bits of news on Twitter! Sorry ’bout that. Normal transmission resumes shortly. Friday, Friday…One of my favourite self-appointed tasks is to skim through the internet finding things that pique my interest for my Friday post. Sometimes it’s a Friday Funny, sometimes it’s a slightly more serious post – and sometimes, it’s completely random. Today it’s random. Isn’t that stunning? Absolutely beautiful. THE BOOKS WHICH DEFINED THE WAY WE THINK NOW. Their own ideas, in their own words, neatly honed into little half-hour or so reads. Just what it says… Something that is missing from most of our education is just a touch of philosophy, so take a half-hour and find out what the ancients reasoned over. I love visiting psychology sites – you can learn all sorts of bits and bobs about how and why we do things. Psyblog is one of my favourites, and this post about human attention is fascinating. Ever wondered what would happen if we didn’t notice that we were in someone else’s house, and just helped ourselves to whatever was in the cupboard without asking? 18 ways attention goes wrong is worth thinking about! Cats and brains. A curious combination that occurred to me as my beloved Puddy becomes psychocat, tearing up and down the hallway for absolutely NO apparent reason! And finally, this appealed to my guilt. TV, it’s got to be good for you. First up, Left/Right asymmetry in the brain – a nice news piece found at virtualmedicalcentre.com. A video about chronic daily headache is also available on the site – take a look at it for some good information on ‘new daily persistent headache’. If you have a spare hour or two, you can head to Dana.org for an explore through their pages on brain stuff. You could spend a long, long time in there – luckily they have a good search function and you can find your way around reasonably easily. A very brief snippet about emotions and physical health – the basic finding is that how you feel emotionally influences how you feel physically. Everywhere in the world – not just in affluent countries, but also in places where basic survival is hard work. Not a new finding, but news again – sending patients for MRI or CT or other investigations is again found not to be helpful in terms of outcomes… When will doctors and patients get the message? Way cool sites to visit! I’m not really seriously blogging at the moment, just strolling through random sites, and coming across some funny stuff. One page to go to is Attractors – enjoy moments of fun-filled timewasting by moving the tiny balls around so the even tinier balls bounce and swirl! this came courtesy of The Cleverest which has moments of hilarity and some rude bits too. Quick post today for Friday Funnies…I’ve been playing around with flash photography today (off camera flash or strobist) shots, so not a lot of time for interweb crawling. Do you know the names of the three wise monkeys? faster than the speed of sound. cruelty of sending pigs to a slaughterhouse in Bonn. two hapless protesters to death. to squirt blood 30 feet!! Remember, you read it here. Caffeine is the common name for 1,3,7-trimethylxanthine. When purified, caffeine produces an intensely bitter white powder that provides a distinctive taste in soft drinks. The word “caffeine” came from the German word kaffee and the French word café, each meaning coffee. After ingesting caffeine, it is completely absorbed within 30 to 45 minutes, and its effects substantially diminish within about three hours. It is eventually excreted so there is no accumulation in the body. Caffeine has been shown to affect mood, stamina, the cerebovascular system, and gastric and colonic activity. Caffeine is naturally found in certain leaves, seeds, and fruits of over 60 plants worldwide. The most common sources in our diet are coffee, tea leaves, cocoa beans, cola, and energy drinks. Caffeine can also be produced synthetically and added to food, beverages, supplements, and medications. Back in 1928, caffeine was shown to have no significant impact on urinary output. Subsequent studies have shown that caffeine-containing beverages did not impact urinary output any differently than other beverages. Caffiene is OK to have if you experience pain – it can help especially with migraine, offsetting some of the drowsiness that occurs with some medications. ——–>>>>> can you see him??? ***hint***He’s just about the size of a coffee bean. Have a wonderful weekend – and don’t forget to come back on Monday. psssst! how many shopping days until Christmas?!! It’s nearly the end of Friday here in NZ, but the rest of the world probably still has hours to go before hitting the weekend. So to help you through your final few hours of Friday, here’s some interesting stuff to keep you amused. First up: PsyBlog has some stunning stuff. Today’s topic? 7 Reasons Leaders Fail... and just before Christmas, you might want to take a look at this one… How poor gifts affect relationships. Don’t say I didn’t warn you. 1. 75% of people in Portugal stay up past midnight, the highest percentage of any country. 2. 7 of the top 10 nocturnal areas are in Asia, led by Taiwan, where 69% turn in after midnight. 3. The Japanese sleep less than anyone else on the planet, with 41% snoozing just 6 hours or less each night. 5. One of the loudest snores recorded in Guiness World Records was 93 decibels (120db is a jet engine), by Kare Walkert of Kumla, Sweden, in 1993. – All courtesy of WebMD. Ooops, I got so carried away with my rant yesterday, I didn’t put my Friday Funnies on! Do you think I need some psychotherapy? You do? And this is definitely both serious – and quirky. Head to the Annals of Improbable Research (AIR) to read about REAL research that is just a bit off the wall – but makes you think. Friday is a day to get ready to relax. For your Friday frivolity, here are some things YOU can do to brighten up your day! Compose a tale made entirely of SPAM! ‘This is to inform you – what could be better than playing with the casino’s money? In order to receive uninterrupted service I want you to assist in donating and distributing these funds to charity in your region on behalf of my humble self and my late husband. I am Mrs. Marina Litvinenko, wife of Alexander Litvinenko, a former Russian security officer who died in a London hospital after apparently being poisoned with the highly-toxic metal thallium by Mr Lugovoi,a Russian Government Paid agent. friday is geek appreciation day?